FORTALEZA, Brazil, Aug 24 2011 (IPS) - The port of Pecém in Brazil’s impoverished Northeast region received a large order to unload and store cement factory equipment imported from China. The port authorities were unable to accept the original order, as the cargo would have occupied 40,000 square metres of storage space, nearly half the total available. The order, which arrived a month ago, is still under consideration, and the director of deployment and expansion for the Pecém terminal, Hernani de Carvalho Junior, has devised a practical solution. 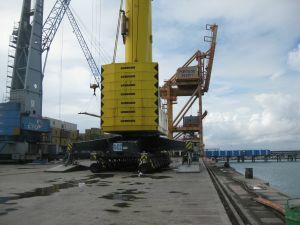 He recommends the equipment be delivered in two lots, with the second being unloaded after the first has left the port storage space. The large order is highly unusual, but it is a sign of the industrialisation taking place in the semiarid Northeast, Brazil’s poorest region. Many industrial investments have been attracted by new ports designed also as manufacturing and energy production hubs. Pecém is being developed as an industrial and energy hub on an area of 330 square km adjacent to the port on the Atlantic coast, created in 2002 some 60 km from Fortaleza, the capital of the state of Ceará. The concept was that it would attract other industries with its two large initial projects, a steel plant and an oil refinery. As it turned out, things “did not happen in that order, but the port was built anyway,” after restructuring it for handling “general cargo and container traffic,” Carvalho Junior said. And in fact, companies are flocking to set up factories here. A score of service, energy, and cement industries, including manufacturers of wind turbines, have already made their bases at the Industrial and Port Complex of Pecém (CIPP), which is administered by the Ceará state government. BRAZIL: Biofuel Production – Local Development or Social Breakdown? The steel plant is under construction. It is expected to open in 2015, and to produce up to three million steel plates a year. Meanwhile, state oil giant Petrobras plans to open a refinery in 2017 that will be capable of processing 300,000 barrels of crude per day. Two thermoelectric power plants are also under construction and are expected to contribute 1,080 megawatts to local electricity generation, nearly doubling the current power output of the state of Ceará. The plants will burn coal imported from Colombia, so their location adjacent to the port is crucial. When the port had just opened, a Chinese ship was unable to dock because of the force of the winds, Melo pointed out, describing the incident as “embarrassing”. An L-shaped breakwater was hastily erected. Melo added that completion of the port terminal had been followed by erosion of the beaches to the west of Pecém, a phenomenon similar to what was seen in Fortaleza, after the port there was built 60 years ago. He also criticised the social effects produced by the sudden, drastic job losses experienced by people employed in construction of factories and other buildings on the industrial estate, when the work was completed and their labour was no longer needed. “Unless production chains” are in place – like a metallurgical hub alongside the steel industry – the companies in Pecém will only create a limited number of jobs, he said. Carvalho Junior’s response to such concerns is that after the steel mills are in operation, the metal laminates industry will follow, and perhaps an automobile plant, while the oil refinery will attract petrochemical industries. And he denied that the port is harming the environment. Pecém is “seven days from the Spanish ports and six days from the U.S. state of New Jersey,” Carvalho Junior noted. Moreover, the newly inaugurated multi-purpose terminal has a draft of 18 metres, which allows even the largest vessels to dock “without any need for dredging,” all of which contributes to the low costs that attract shipping companies, he said. Underwater measurements show there has been no change in the depth of the local marine shelf between 1997 and 2009, indicating no sediment is accumulating and, therefore, no dredging – a major expense in the maintenance of other ports – is required, Carvalho Junior told IPS. And the port of Pecém has all the latest generation equipment, he said. That is why cargo handling at this port has “grown exponentially” in recent years, confirming its future role as a transport hub, at the centre of countless shipping routes, Carvalho Junior said. The deepwater offshore port terminal of Pecém is protected by the 1,768-metre long breakwater, and is connected to land-based storage warehouses by a road and railway bridge and by pipelines, a cableway, chutes and ducts. The facilities are currently being expanded, with the aim of handling 5.6 million tons of cargo in 2012, nearly twice the amount handled in 2010. Its main logistical advantage is its geographical position, as it is 3,000 km closer to Europe and the eastern seaboard of the United States than Santos, Brazil’s leading port, in the southeast of the country. But the main goal for the integrated industrial-port complex is to foment development in Ceará and have a multiplier effect throughout the Northeast region. The industrial zone is six kilometres inland from the port. The coastal dunes, vegetation and wildlife in the area between form an environmentally protected conservation area. The projected roads, railway and cableways and ducts, as well as tax breaks for export companies, are very attractive to investors. Other factors in favour of the industrialisation of the Northeast include an expanding market in the absence of local production to supply many items like steel and oil derivatives, and lower wages for labour than in the more developed centre and south of the country, although the downside is that workers in Ceará are relatively unskilled. Ceará state’s GDP grew 7.9 percent in 2010, placing it third among the states of the Northeast region, behind Pernambuco and Bahia. The Northeast as a whole has enjoyed higher economic growth than the national average in recent years. Pernambuco was the fastest growing state in Brazil last year, with GDP expanding by 9.3 percent, largely due to the contribution of the port and industrial complex of Suape, in the metropolitan area of Recife, the state capital. This is the model Pecém wishes to emulate. Designed in the 1970s, Suape is a pioneering “superport” which has only reached full maturity in the last decade. Now more than 100 companies are based there, and another 130 construction projects are under way, representing estimated investments of 25 billion dollars. Nearly 50,000 people are employed in construction jobs. Petrobras is building a refinery in Suape that is expected to be completed by 2014, as well as a huge petrochemical plant. A shipyard that is a joint venture between Brazilian contractors and South Korea’s Samsung has employed 7,400 workers since 2008, and many beverage, ceramics and food industries have been set up. Within a few years, Pecém and Suape will be linked by the Transnordestina railway which is being laid across the semi-arid interior of the Northeast. The railway, in conjunction with the road network that is being extended and upgraded, will provide a transport system to support industrialisation in the Northeast, which is a half century behind southeastern Brazil.